As the Department for Transport announces it will not continue with initial plans to increase agricultural tractor and trailer weight limits on the road, Richard Bradley spoke to industry experts at a recent National Association of Agricultural Contractors (NAAC) conference, to outline the dos and don’ts of safe road transport. Modern trailers are often specced with wide tyres, suspended axles, air brakes and LED lights to operate better, both in the field and on the road. In a recent statement, the Department for Transport (DfT) announced trailer and gross train weights (GTWs) for agriculture would not be increased, putting the brakes on a two-phase plan to bring regulations in line with modern day agriculture. The reasoning behind this decision, the department says, is due to increased road wear which would be caused by increasing trailer weight limits. Regulations in Germany allow up to 40t GTW, with maximum axle loading of about 8t; depending on axle spacing. So a tri-axle trailer, with an additional 4t transferred onto the tractor's hitch, can weigh up to 28t - about 10t higher than UK regulations allow. However, the model used to simulate this is believed to use similar parameters to HGVs, and does not take into account wide flotation tyres now common practice on agricultural trailers. Martin Hays, chairman of the National Association of Agricultural Contractors (NAAC), says: “Brexit will add further challenges to compete on a world market and it is essential contractors and farmers have the tools available to work efficiently and safely. To clarify what you can and cannot do with your tractor and trailer combination on UK roads, we take a look at the basics. The first major stumbling block when it comes to road transport is implement width, which applies to the towing tractor and any implement, trailer or trailed appliance. Overall width does not include folding mirrors or tyre bulge. If your overall width is less than 2.55 metres, you are allowed to travel up to a speed of 40kph (25mph). If your width is 2.55-3.5m, your maximum speed is limited to 32kph (20mph). 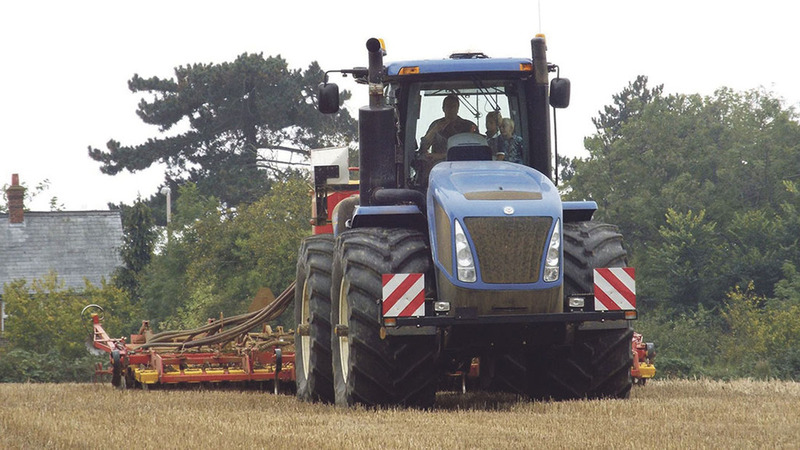 Most high-capacity combines and articulated tractors on wide tyres measure over 3m wide, so require an annual police dispensation to travel on the road. Stray above 3m and you will require an annual police dispensation, which allows your machine to travel on the road. This applies to most combines on wide tyres, for example. If the vehicle measures more than 3.5m, the same rule for dispensation applies. However, a 19kph (12mph) speed limit applies. Towing a trailed implement, such as a cultivator, rake, baler, slurry tanker, sprayer or basically anything other than a trailer, also limits you to 32kph (20mph). As part of the DfT’s phase-one road limits increase in 2015, the maximum possible GTW increased from 24.39 to 31 tonnes. Maximum trailer weights, however, remained at 18,290kg. 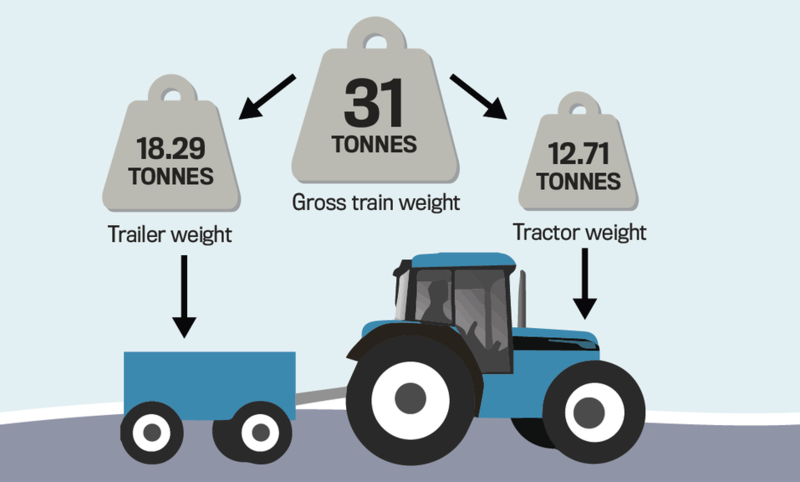 Despite the March 2015 increase for tractor weights, maximum trailer weight remained at 18,290kg. The theory behind this change was to allow larger tractors to tow trailers, which should make for safer transport. This means a 16t grain trailer, which weights 3,360kg, will only be able to take a load of 14,630kg to comply with the road legal weight limit in the UK. While a police dispensation can be used to transport vehicles of more than 3m down the road, it does not allow the GTW to be any higher than 31t. To give you an idea, a fully laden John Deere 9620RX weighs 28,123kg, so only allows 2,877kg to be legally towed or carried down the road by it. Road legal trailers are fitted with a plate which quotes unladen weight, maximum axle loading and maximum gross weight. A four-track crawler, such as JD's 9RX or Case IH's Quadtrac, have a limited towing or carrying capacity on the road. All trailers must be fitted with a hand brake, which is capable of locking two wheels to hold the trailer. For trailers and mounted or trailed implements to legally travel on the road, they have to comply with a number of regulations. 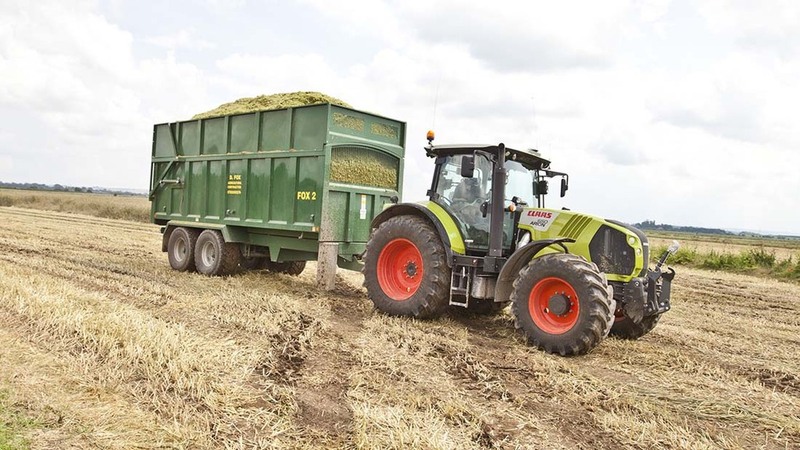 If the trailer or trailed implement’s weight is more than 14t, it has to have brakes fitted which provide greater than 25 per cent braking efficiency. While this is possible with hydraulic brakes, the NAAC says they have to be well maintained to meet this standard. A handbrake also has to be fitted, which is capable of locking two wheels to hold the trailer. Rear marker lights, indicator lights, brake lights and a number plate with a light must be clearly visible from the rear of the trailer or implement. Rear marker lights, turning indicator lights, brake lights and a numberplate with a light, must be clearly visible from the rear of the vehicle at all times, so if an implement obstructs the tractor’s lights or numberplate, additional ones must be fitted. Reflective marker boards must also be fitted to indicate the outermost parts of a vehicle. 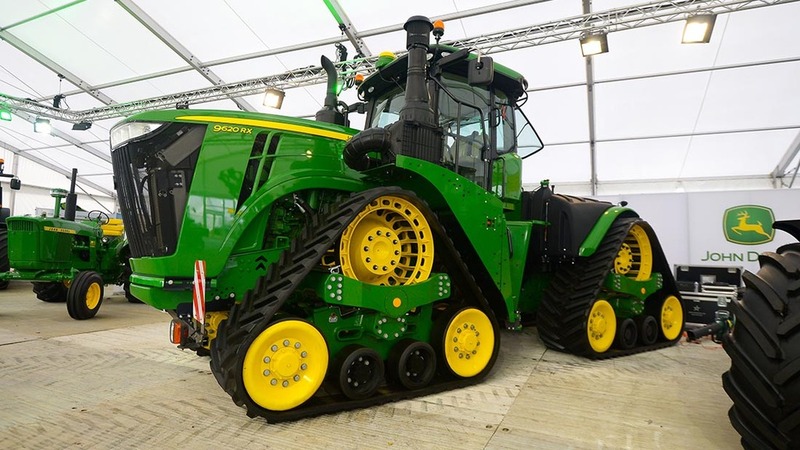 The lights must be no more than 2m from the rear-most part of the trailer or implement, and the numberplate, which can be the same as any road-registered tractor, loader, self-propelled forager or combine registered to the farm, cannot be hand-made – a genuine plate has to be fitted. He says items such as lights and numberplates are often only on the options list, and have to be fitted to all trailers and implements, whether they are trailed or mounted – even ploughs. Brakes must be fitted to trailers and implements weighing over 14t, which provide greater than 25 per cent efficiency. While possible with hydraulic brakes (pictured), they have to be well maintained. ...air brakes (pictured) provide much higher efficiency. Air brakes also provide a fail-safe braking system - if the trailer was to become detached from the tractor, the brakes would be applied. 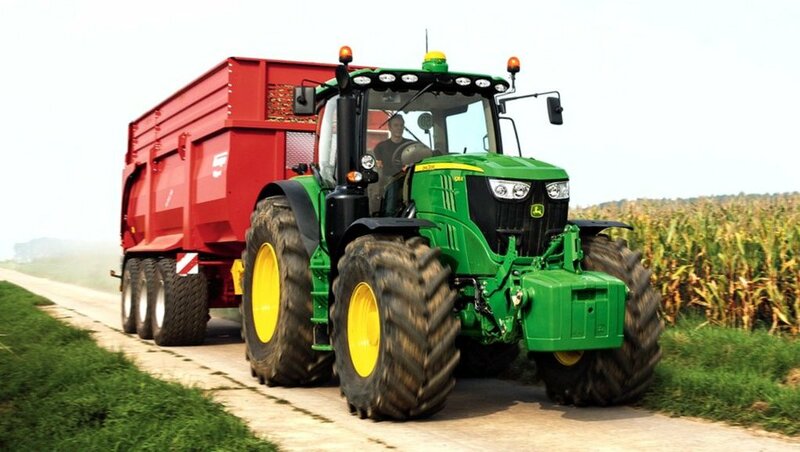 High-speed tractors have different limits, as they comply with HGV road regulations, meaning they are allowed to travel up to 65kph (40mph) on UK roads. To comply with HGV regulations, vehicles have to be fitted with suspended axles at the front and rear, disc brakes on all four corners, dual-line anti-lock braking system, fail-safe steering and measure less than 2.55m wide. Of the tractors on the market, only JCB’s Fastrac and Mercedes’ Unimog fall into the high-speed tractor bracket. Even if specced up suitably, towing an implement (such as a tanker) behind a high-speed tractor limits you to 32kph (20mph). Any trailer towed by your Fastrac or Unimog has to meet HGV regulations, which means suspended commercial axles, dual-line, air-operated brakes which have more than 50 per cent braking efficiency and ABS, and load- and speed-rated tyres are required. Similar to cars and trucks, tyres on the trailer and towing tractor require at least 1.6mm tread depth, and the tyre can have no cuts or bulges. Any trailed implement, towed by a high-speed tractor, as with conventional tractors, restricts you to 32kph (20mph). Passing the current, very basic, category F test at 16 years old allows you to drive a tractor and trailer combination, as long as the overall width is not more than 2.45m, and the trailer has either a single axle or two close-coupled axles, where the axles are less than 840mm apart. "A licence change for agricultural vehicles is well overdue." Once you turn 17 and have passed the category F test, or pass the category B car test, you are allowed to drive upto the maximum road legal tractor and trailer combinations. Driving a tracked machine on the road requires a separate category H licence. Regulations on fuel can become complicated, as it depends on the job you are doing and where you are going. Taking produce from the field to be processed may be done on red diesel. However, it may be classed as general haulage if the produce is being transported more than 24km (15 miles) from the farm, which could mean white diesel is required. Farmers transporting crops from the field to your farm can run on red diesel. Contractors however, may have to run on white, and further haulage restrictions will apply. Transporting products out to a third party, for example to be sold, can also be classed as general haulage. Transporting crops from the field, or agricultural inputs such as feed products, straw and fertiliser, to your own farm is classed as agricultural use, so there are no distance limitations on running with red diesel. Transportation of agricultural produce by a contractor, employed solely for that purpose with a tractor and trailer, must be done on white diesel and further road haulage restrictions will apply. Among the discussion topics at the conference, it was pointed out if a machine has a seatbelt fitted, it must be worn at all times on the road (as with any car or other road vehicle), and according to HSE regulations, as a safety device, they must be worn at all times during operation. Mr Cox says HGVs and haulage trailers have to undergo regular testing to ensure they are safe to use on roads, but just because testing is not required in agriculture, it does not mean vehicles do not have to be safe for use on the road, so regular checks should be carried out.